Pets provide companionship and fun, but for some people a dog or cat can also trigger sneezing, sniffles and worse. Does an animal allergy mean a life without Fido? Not necessarily. 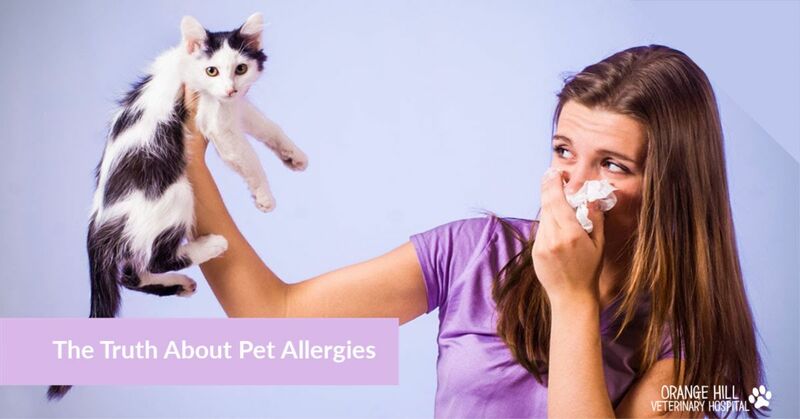 There is a myth that pet allergies are triggered by animal hair, but they are actually caused by a protein found in pet skin (or dander), saliva and urine. Some dog breeds are labeled “hypoallergenic” as they shed less, but no dog is 100% hypoallergenic – even hairless dogs still have some allergen. Each animal is different, and a particular pet allergy sufferer may do better with one breed than another. If you’re allergenic and want to get a dog or cat, consider looking for shorter hair and less shedding, although there isn’t real scientific evidence this will help. Some allergists have suggested that a dog that tends to keep its coat throughout the year may be better for allergy sufferers. Dog breeds like bichon frise, poodle, and the Portuguese water dog come to mind. Other factors, such as your pet’s disposition, might make frequent bathing more feasible. No dog is 100% hypoallergenic. Even hairless dogs produce some allergens. Keeping pets out of the bedroom can help reduce allergy symptoms. 2. Use a HEPA air purifier/filter to trap dander. 3. Clean carpeting frequently, or opt for wood, tile or linoleum flooring. 4. Speak with your vet about a balanced diet for your pet, which can prevent skin and excess shedding. 5. Keep your pet off the furniture – cover upholstered chairs with towels and sheets and wash them on a regular basis. 6. If your dog rides in the car, use covers on the seats and wash them frequently. 7. Have someone without a pet allergy brush the pet outside to remove dander as well as clean the litter box or cage. There’s no guarantee that someone who is truly allergic to pets (about 10% of those with allergies) will tolerate living with a dog or cat. If you’re thinking about getting a pet, but are concerned about allergies, consider trying one out on a trial basis. You can also begin allergy treatment before getting a pet, including allergy shots such as for cats.